Please consider donating a portion of your profits. You don't have to, but if you choose to do so, your donations will help us to provide free or "free for shipping" curriculum to homeschool families in need! 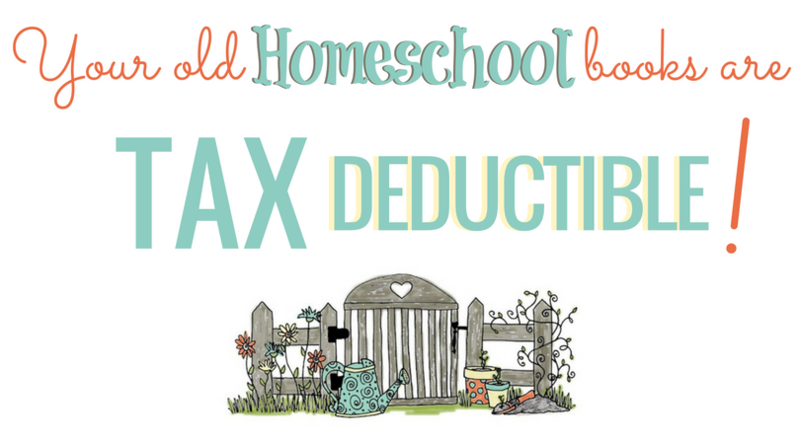 We can still truthfully say that 100% of donations is used to benefit the homeschool families we serve. All persons involved in the running of this organization are still completely volunteering their time and talents, and do not receive payment for their work here. And, we are families just like you - we don't have much money either, so we need your help! So many families contact our organization every day for assistance. We really want to help them ALL! If everyone in the group (over 15,600 of us!) 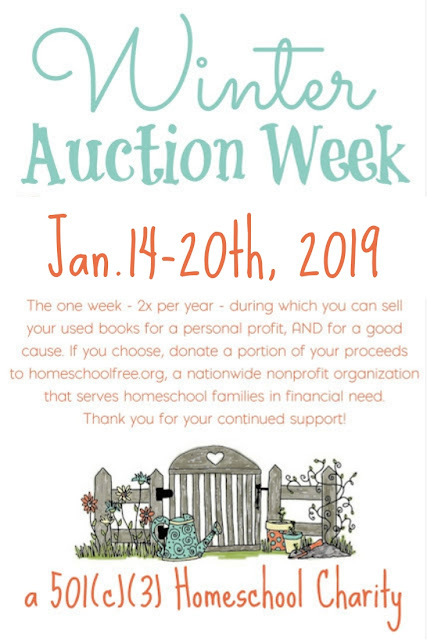 sold just one book during Auction Week and gave $2 - that would be a complete miracle, and we'd have an amazingly HUGE budget to use for sending out curricula to needy families. But, not everyone will see this. So we hope that at least some of you will see it, participate in auction week, and give. If you don't want to donate any of your profits, that's ok too! We hope most of all that everyone who participates will JUST HAVE FUN with it! Thanks for helping us to help others! Thanks for your donations of curriculum every day within our Facebook group! We are so blessed to witness your kindness! To donate, click the "Donate" tab at the top of this page, or any of the links within this post. AUCTION WEEK WILL BE HELD JANUARY 14-20th, 2019. Auctions must be completely closed on or before 11:59 pm YOUR TIME January 20th, 2019. After midnight on January 20th, no more bids may be placed, and no more selling will be allowed within the group (however, you may keep your posts up as long as needed to close out your sales). There are NO pre-approved vendors this year. Promoting your at-home business in an attempt to gain personal information from our members is NOT allowed. This includes sales businesses like Mary Kay, Pampered Chef, etc, bookstore businesses, curriculum publishers who are not SPONSORS of HSCFFS, etc. is NOT allowed and you will be banned immediately. Please report such posts to the moderators and we will remove them. Businesses that are in our group for self-promotion are never allowed. We've worked hard to build a safe, non-solicitous group and do so voluntarily, and have advertising packages available for serious businesses who wish to sponsor our cause. Please feel free to inquire if you'd like advertising privileges. Your sponsorship money goes to support families in need with new curriculum, co-op scholarships, and school supplies. Thank you for understanding. We accept donations of any size after your auction is complete. Suggested donation is $2 per person. You are NOT REQUIRED to donate, but if you do, you will be helping us to provide used or new, free or "free for shipping" curriculum to homeschool families in need. 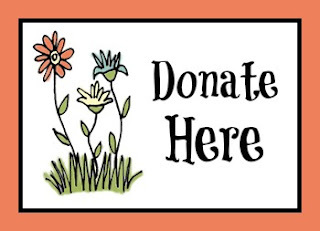 Cash donations are EXTREMELY rare, and are very much appreciated. Please help us with whatever amount you feel led to give! Donations can be made here. YOU (the donor/seller) are in complete control over when/how/why your auction is closed. Bidders should not complain about your choices in who receives your item if your terms have been clearly stated. Never miss stuff like this! Subscribe to our member emails, and you'll get notification of every post from this blog.